With each passing storm, we feel the urgency to get in as much snow time in as we can. I think this is because the last two winters were so deprived of snow. We know and appreciate that winter won't last forever, this is the beauty of living with four seasons, and we are looking forward to spring. 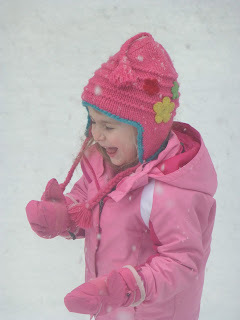 But for now, we are still focused on fun in the snow. This winter marks one of the snowiest February's on record and we have enjoyed all of the snow play this year. The kids are at that GREAT age where snow play can go on for hours. Now that they can both easily maneuver in the snow there is so much to do. Our favorites are building snow people, watching the clouds and sledding. 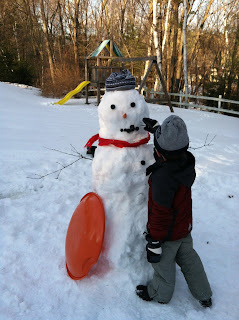 Z also loves his snowball fights and Lil' C's favorite thing is EATING the snow! Can you tell what my favorite is?? The rains this week have washed much of the snow away and we spotted this guy last week....a true sign of spring. But this is New England and you never know what Mother Nature might throw at us later in the season. No matter what, I am grateful for a wonderful winter filled with so many great memories. And today & tomorrow we expect 6 to 10 inches of the white stuff.